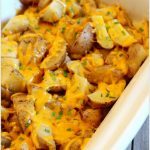 Slow Cooker Cheesy Potatoes and Chives–a perfect side dish for dinner or a potluck, with only a handful of ingredients and the crockpot doing all the work this will be your new go-to recipe. 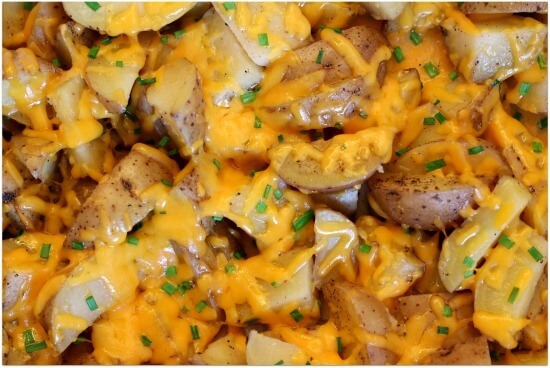 All you need to do is start with some yellow potatoes and a cutting board. You could probably substitute red potatoes if you wanted, but I wouldn’t use Russets (they don’t seem to have high enough moisture content). 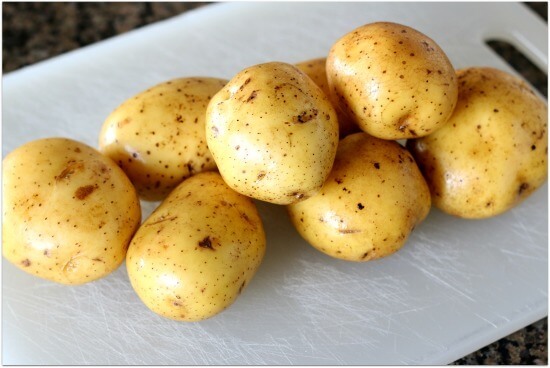 I used 2 lbs 4 oz of potatoes and I measured them with my kitchen digital scale (which I can’t live without btw). After I washed my potatoes, I cut my potatoes in half and then in half again (so in quarters). You can cut them in smaller bite-size pieces, if you’d like. 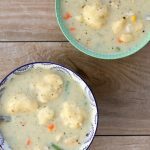 I used my casserole crock for this recipe (which is such a great crockpot), but you can just layer the potatoes in a regular 6 quart slow cooker, if that’s what you have at your house. You’ll then add in some salt, olive oil, garlic powder and black pepper (cheese comes later) and let them cook for a few hours. 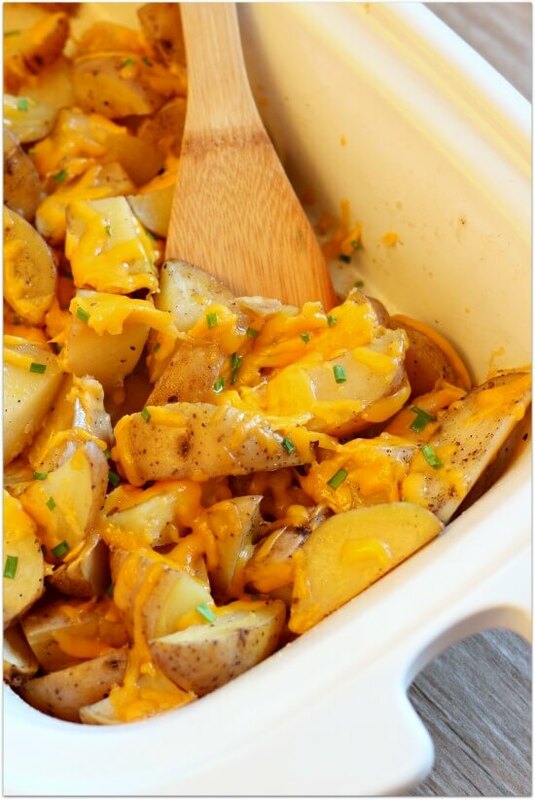 Once the potatoes are soft and cooked through–it’ll take about 3 hours on high–you can sprinkle cheese and chives on top and let it get all melty. 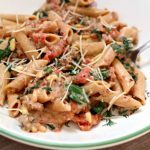 One thing that would be amazing is adding bacon crumbles on top too! 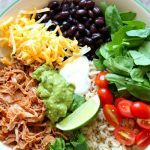 I didn’t have any at home when I was making this but that would just add this dish to a whole new level. 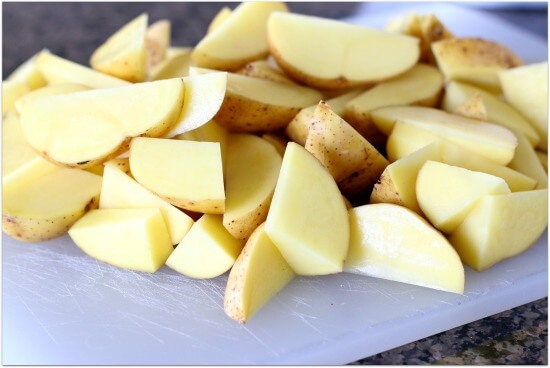 Wash potatoes and cut into quarters. 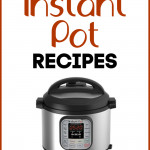 Place in the bottom of your slow cooker. 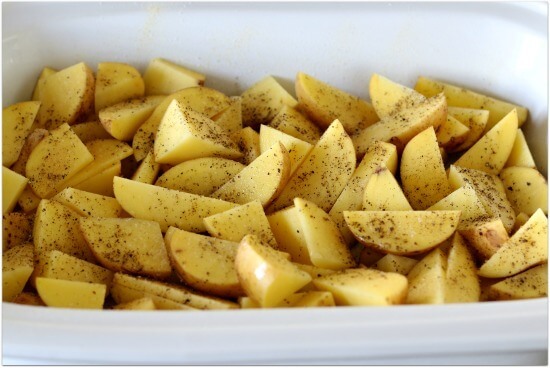 Sprinkle the potatoes with salt, olive oil, garlic powder and black pepper. Use a spoon to stir the potatoes and coat evenly with oil and spices. Cover and cook on high for 3 hours or on low for 5-6 hours. Remove lid and sprinkle evenly with cheddar and chives. Put the lid back on and let the cheese all melty for a few minutes (like 5 minutes). Serve immediately. 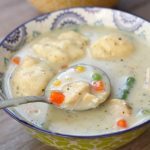 I love the flavor of this dish and my family does as well. 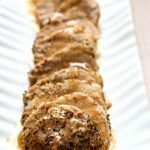 This is a side dish my family would love! 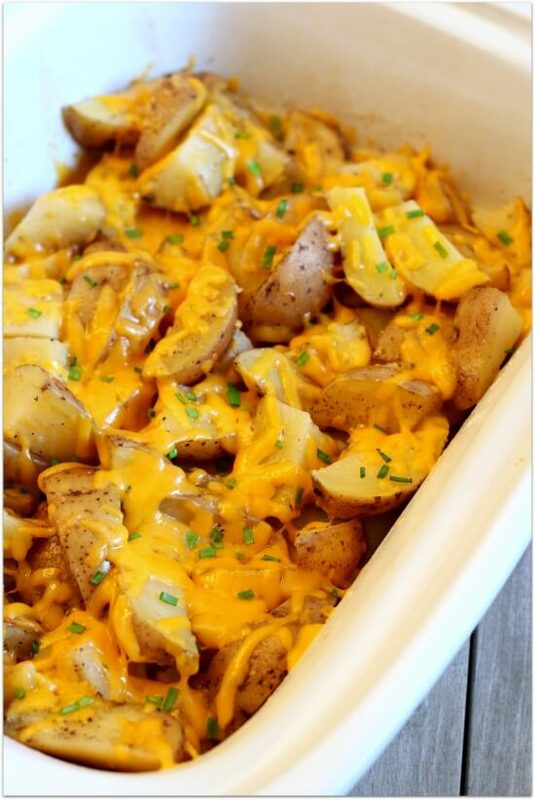 Cheese and potatoes are always a winning combination in my book!